Carpet Valet - Cleaning Services, Driveways/Patios/Paths based in Christchurch, Dorset. Professional Carpet & Upholstery Cleaning, Deoderising & Stain Protection. 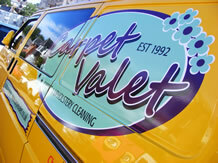 Carpet Valet is a family business covering Poole, Bournemouth and surrounding areas. Established in 1992, we have built up a reputation for quality service at an affordable price.